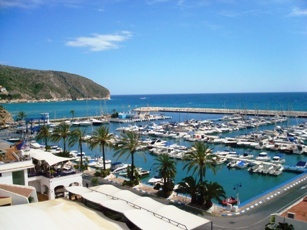 This page is all about the town of Moraira on the Costa Blanca coast of Spain. It contains useful Moraira tourist information for people intending to visit or holiday in Moraira. In this tourist guide to the tourist resort of Moraira on the northern Costa Blanca in Spain we help visitors who are planning a trip with useful and practical advice on many tourism related subjects such as airport transfers to Moraira, car hire, accommodation, hotels, hostels, villa rental, apartments to rent, map, sightseeing, weather, where to go, where to stay, travel information and what to see and do in Moraira. If you are visiting Moraira on holiday or if you live in Moraira or are thinking of moving to Moraira we hope this page on Moraira tourist information has been useful. Below we have a short video of the beach of Moraira and a panoramic view of Moraira’s bay. To make the best of your visit and holiday we cover everything you need to know about Moraira. We also have photos, picture galleries, views, videos and webcams of Moraira. To get to Moraira you can either fly into Alicante airport or Murcia airport. Once at the airport you have a range of different airport transfer options to Moraira including private shuttle buses, taxis or Moraira car hire. Moraira is on the coast below Javea. It has grown from being a small fishing village to an attractive holiday and retirement town. Moraira is still small and compact, ideal for the older person. The buildings are all low-rise which is nice and probably because of this it retains it’s unique charm. The main beach in Moraira (L’Ampolla) is sandy but nothing like as good as other beaches in Costa Blanca such as Benidorm, Javea, Denia or Calpe. The list could go on and on – ok it’s nice but nothing special! Having said that there is a hidden gem just round the corner. It’s a little known beach area called El Portet. Its almost like a Caribbean bay, the water is turquoise, the road to it is winding, the hills are alive with pine trees. the waters are very calm and safe for children. Do also check out Moraira’s other sandy beaches of L’Ampolla and Plagetes, and also the tiny rocky coves with clear blue water (L’Andragó, Punta Estrella and La Cala). The Moraira valley is stunning. It is full of whitewashed villas, it’s very green with lots of pine trees. Moraira’s marina is very nice and swanky. This area contains some amazing restaurants, it’s a great area for eating outside. The main street is small and colourful with an excellent variety of local shops. Make sure you visit the local market selling fresh fruits and vegetables as well as other locally-made goods and produce – market day in Moraira is on a Friday morning. Address: Carretera Moraira-Calpe 8, 03724, Moraira. Opening Hours: Winter (1/11 to 31/3): Monday to Friday from 10:00 to 17:00 h. Saturday: 10:30 to 13:00 h. Spring-Fall (1/04 to 30/06 and 1/09 to 30/10): Monday to Friday, from 09:30 to 13:30 h. and 16:00 to 19:00 h. Saturdays from 10:30 to 13:00 h. Summer (1/07al 31/08): Monday to Saturday from 09:30 to 13:30 and 16:00 to 19:00 h. Sundays from 10:30 to 13:30 h.
Moraira Tourist Information – Page Summary – This page contains unique content about the beach resort of Moraira, a popular tourist destination on the northern Costa Blanca coast of Spain.